The Power of Story | JACL PSW in Blogland! I stumbled upon this AARP article on Heart Mountain and its incarcerees. It’s a touching slideshow of the brief history and people of Heart Mountain. They also had interviews of some of the people that were incarcerated there. As I read through each of the interviews, it reminded me of the power of story. History is presented to us in the form of facts, dates, and chronological events. I remember making flash cards to memorize these important dates and events for exams, and that’s what they became. But when I read the stories of people who experienced these historical events they become more than words in a book and dates on a page. They become a voice that can be heard to the present and future generations – more than a textbook can ever do. That’s where Oral Histories comes into play. Oral histories becomes such a key tool in preserving our history since many of these stories gets over-looked and lost between the dates and chronological events. 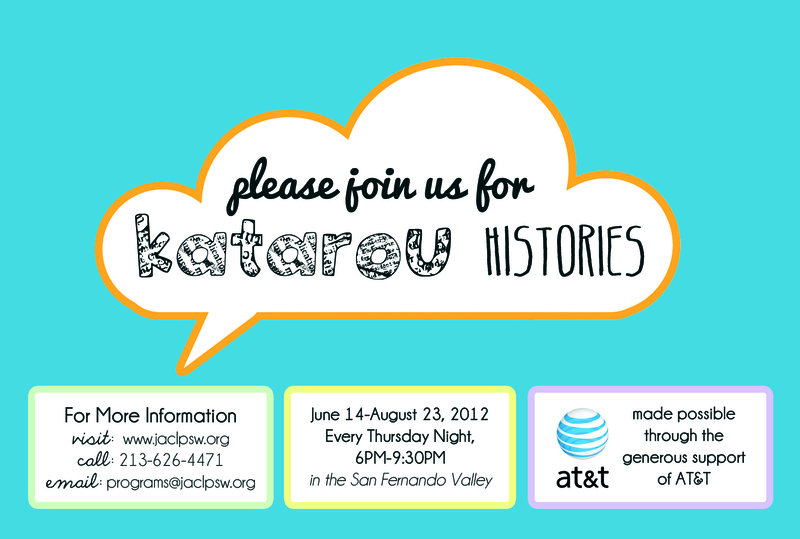 JACL-PSW has a new program called Katarou Histories and attempts to preserve these histories and bridge the generation gap in the Japanese American community in the San Fernando Valley. History is much alive and we still have a chance to hear it first hand. And that’s what Katarou – Histories tries to do. We just had our first meeting last week and talked about identity. Can’t wait to see the final project. Keep a look out! In the end what makes history alive is the story that we are all a part of. Some are included in the first chapters, other in the middle, some towards the end, and many, many more to come! Here is the AARP article, make sure to click on all the links at the bottom to read each incarceree’s story. Read more about our newest program Katarou Histories. A picture of Heart Mountain and Katarou Histories: Bridging the gap between past and present through the power of story. LOVE the closeup photos of these remarkable people!